Mish's Global Economic Trend Analysis: How Does One Invest For "Muddle Through"? How Does One Invest For "Muddle Through"? In your post How does one invest for inflation and deflation? you addressed investment themes for hyperinflation and deflation. What about the middle ground? How about a scenario of mild, but higher than market-predicted inflation.... inflation rates of 5% to 10% per year. That would be troublesome to retirees and others, and is far more probable than the much rarer, and more extreme, disastrous scenario of hyperinflation. All I care about is the inflation of the prices of the goods and services I use. This is much higher than the official rate of inflation, though it is certainly not hyperinflation. How linked is the world economy to the U.S. consumer? Would global stocks still roll on, if the U.S. economy stagnated? Would commodity prices stagnate? Wendy, thanks for the question. There are many proponents of the "Muddle Through" idea, most notably my friend and fellow Minyan John Mauldin. A Google search for "Mauldin Muddle Through" will turn up a lot of hits. Bear in mind, my use of "Muddle Through" below may not exactly match his usage. Before we address specific ideas, let's tackle a common misconception that somehow we are going to have both inflation and deflation at the same time. The idea behind this faulty premise is that prices of things we need (food and energy) are going to rise and prices of things we want but do not need (manufactured goods from China) are going to fall. While that is possible in regards to prices, the idea that we can have inflation and deflation at the same time is impossible. Inflation is an expansion of money and credit and deflation is the opposite. It is fundamentally impossible in the context of a correct definition to have inflation and deflation at the same time. What about the prices of necessities? Wendy, you may claim that all you care about is the prices of the goods and services you use, but I don't think you really mean it, at least from an investment standpoint. In an investment context, it is important to understand why prices are rising. For example, if gasoline and food prices are both rising because of a misguided ethanol policy helped along by peak oil and failed administration policy in the Mideast (I believe that to be the case), the treasury market is going to respond in a far different manner than if energy prices are going wild because the Fed is printing money. The average person at the pump may not care, but the investor better care because it matters. Certainly there is nothing the Fed can do about misguided administration policies but the Fed can address some money supply concerns. Those who claim the Fed is currently printing like mad simply have no solid evidence to support it. What the printing like mad crowd is talking about is M3 (credit) which indeed has been soaring. Unfortunately these "printing" claims keep making the rounds but repeating a false claim 200 times does not make it the truth. Printing claims are typically made by people who do not understand the difference between money and credit. While credit acts like money in most circumstances, when debt can no longer be serviced, the difference is enormous. Right now we are seeing huge warning signs that debt can no longer be serviced. Those signs are soaring foreclosures, soaring bankruptcies, soaring defaults in credit cards, and a slowdown in consumer spending. In spite of what one thinks about the CPI and how manipulated it might be, one can expect treasuries to rally in this environment. Indeed they have. Many have emailed me with thought on the CPI rising a seasonally adjusted 0.8 percent in November, a whopping 4.6% increase from a year ago and screaming "Where are the bond vigilantes?" My response was the treasury market is acting quite rationally in the face of rising defaults across the board in all kinds of financials. This leads us to a key idea. If one expects some sort of muddle through in which banks are impaired because of writeoffs, where foreclosures and credit card defaults are rising, and unemployment is about to increase dramatically, the correct answer is to continue to hold treasuries regardless of what one feels about the CPI and prices. If one thinks the Fed will print its way out of deflation, then one certainly does not want to be in treasuries other than perhaps shorter term duration TIPS. The nature of the "muddle through" will dictate investment strategy. The term stagflation is certainly being bandied about recently. I do not like the term stagflation because it is generally used in reference to prices while proper use of the terms inflation and deflation pertain to the expansion/contraction of money and credit. In addition, this stagflation has a peculiar twist: falling interest rates. Typically, falling interest rates are associated with disinflation or deflation, not stagflation. Thus, stagflation proponents perhaps need to consider the possibility that "This is not your father's stagflation". That last comment is in reference to Not Your Father's Deflation: Rebuttal and Peter Schiff Replies to Deflation Rebuttal. I have received many emails recently in regards to yield and inflation adjusted returns. The most common complaint goes something like this: "Prices are rising at x%, the CPI is a crock, so if I get less return than x% then I am losing money." Yes, that is likely true. It has also fueled bubbles in many equity markets (and perhaps even commodity markets) by those looking to do something about it. However, no one is entitled to positive returns. It is entirely possible that for a period of time the best thing one can do is minimize "real" (CPI adjusted) losses. Just a bit ago someone replied to one of my posts "As long as banks can borrow short-term with negative real-rates and lend long-term banks effectively have a license to print money." That is incorrect. Rising prices of goods and services does not guarantee rising price of any investment, including commodities. In a muddle through environment, pension plan assumptions for 10% returns are going to be hard pressed to make. Those taking excessive risks to make them might find themselves with hugely negative returns instead. Assuming we do muddle through, there is still a strong likelihood for a continued asymmetrical unwind of the credit bubble. Implications of that last point are particularly ominous. A carry trade unwind has the potential to affect nearly every equity class. In addition, there are obvious implications on emerging markets and China if US consumer spending is weak. In the muddle through scenario, returns will be poor, and CPI adjusted returns might even be negative, assuming the prices of essential goods like food and energy continue to rise as stated in Wendy's email. However, before anyone writes off the deflation thesis, please consider Things That "Can't" Happen. It is no secret that massive amounts of mortgage resets for both Alt-A and Pay Option AMS will take place over the next few years with the Pay Option Arm problem peaking in 2011 as described in Housing: The Worst Is Yet To Come. It was just six short months ago where corporate profits were expected to rise dramatically. Many claimed forward looking PEs were 16 or so and thus the stock market was "cheap". Some of us challenged that notion. We were correct. Much of those earnings were based on financial engineering that is now producing writeoffs. Another portion of those earnings estimates were based on deal making profits at the brokerages like Bear Stearns (BSC), Morgan Stanley (MS), Merrill Lynch (MER), and Goldman Sachs (GS). These earnings were a complete mirage at best and unsustainable at worst. Think earnings of homebuilders like Toll Brothers (TOLL), Lennar (LEN), or Pulte (PHM) are going to return? What about earnings at retail stores like Target (TGT) or Wal-Mart (WMT) now that cash out refinancing to support consumption is dead and overbuilding has increased competition? The environment is different now. Leverage Buyout and commercial real estate deals on absurd terms are no longer getting done, the appetite for securitized junk has fallen off the cliff, and SIVs that may cost Citigroup (C) its financial life are now a thing of the past. The credit conditions that fostered those so called "profits" are not returning no matter what the Fed does. S&P earnings are now estimated at 23 not 16. A PE of 23 is not cheap. In fact it is more closely associated with market peaks. If more writedowns than expected come, even 23 will be too low an estimate. 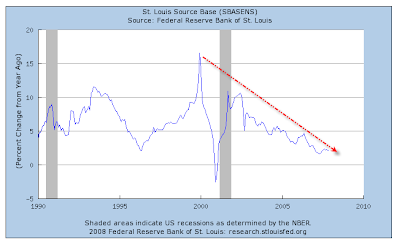 With sinking corporate profits, will corporate expansion and jobs be strong? Hardly. To muddle through, the Fed is going to have to cut interest rates. So will Europe and the UK. Japan on the other hand may have to start raising interest rates. This set of circumstance will lead to a forced unwind of the carry trade. It's fine if you have a different set of assumptions about muddle through, just be prepared to defend them. But please remember that for the last few years nearly every investment class rose in union. It is entirely possible if indeed not likely, that the reverse happens for a few years. What was correlated on the way up can certainly remain correlated on the way down, even if there is an asymmetrical skew to the unwind. In a muddle through economy with weak corporate earnings, mistakes will be punished quickly and severely. Thus safety should be the primary concern. Furthermore, risk in equities and risk in the economy are both heavily skewed to the downside. Return of capital rather than return on capital cannot be overstressed. This idea and other means of "investing safely" regardless of what scenario one believes was discussed in How does one invest for inflation and deflation? The key idea added here is to expect a continued asymmetrical unwind of the credit bubble and to take advantage of that as one can. In the muddle through economy, the Fed will fight deflation tooth and nail, and on again off again win and lose some battles. Long-short strategies that can play relative strength within sectors and or stronger sectors vs. weaker sectors may be the best equity strategy going forward. Otherwise there is simply nothing wrong with building a CD or treasury ladder while one waits for better opportunities down the road. Click Here To Contact Me about Investing For Muddle Through. Good luck and a prosperous new year to everyone.